On August 5th 2005, AHWA became an incorporated body in the State of Victoria. The idea for an organization catering solely to the needs of Australian writers of horror was proposed in late 2002 by Marty Young, a young writer and new resident to Australia. Interest was sought – and quickly found – through the help of the well-established online science fiction forums Eidolon.net and The Australian Science Fiction Bullsheet. New and established writers started offering their support and encouragement, as did agents and editors of speculative fiction. The Southern Horror yahoo group was set up in October 2002 to provide a means of communication between writers (published and unpublished), editors, agents and fans of horror (or ‘dark literature’) in Australia. While the science fiction forums had been invaluable in helping the idea take form, horror needed to find respect as a genre on its own. Southern Horror also offered a place where the needs and wants of an organisation designated specifically to horror could be openly discussed, and a direction for achieving those goals worked out. guidance, especially for those new to the writing industry – where could they sell their stories? What resources were available to them? What was involved in getting published? However, it was not until late 2003 that things really started to happen. With more and more interest being generated, a committee was formed to address the issues and ideas being raised. A committee of eight helped the organisation take its first steps forward, with the formalization of an official name – The Australasian Horror Writers Association, and the development of a website. Since those slow and arduous steps, AHWA has continued to develop to meet the needs and offer more opportunities for Australian writers of horror. The inaugural 2005 Flash and Short Story competition for unpublished stories received far more entries than we envisioned, and with the initial support of Dark Animus and Shadowed Realms, the winning entries saw publication (winning entries are now published in Midnight Echo). 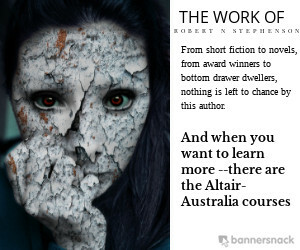 The Australian Shadows award for best Australian horror began in 2005 thanks to the kind sponsorship of Altair-Australia, and in 2009 this award underwent a huge change from one into three categories (Short Fiction, Long Fiction, and Edited Publications). On Halloween 2005, the Californian-based The Writing Show hosted The 14 Days of Halloween special, with members of the AHWA reading some of their stories with added sound effects, like the radio shows of old. This show ceased its run in 2008 after 4 successful years. On the 7th June, 2006, the AHWA opened for official membership, and not only did Australian (and NZ) speculative fiction writers and editors instantly show their support by joining up, but so too did people and places such as Dark Animus, SpecFicMe!, Shocklines, Cemetery Dance magazine, Ellen Datlow (editor of The Year’s Best Fantasy and Horror 2006), IDT Home Entertainment and Icon Film Distribution by offering free and discounted subscriptions, signed books, DVD boxed sets of the Masters of Horror series 1 and free movie tickets. Midnight Echo, the magazine of the AHWA, came to life in 2008, with Issue One edited by Kirstyn McDermott and Ian Mond, with David Schembri as Art Director. The magazine received rave reviews. Each issue is published by a different editing team, and the magazine has gone from strength to strength. More projects are on their way, all with the aim of helping writers of this genre get their stories read by a wider audience, and for the genre itself to gain the recognition it deserves.